So I've been all about the theme of summer lately and I wish I could bring you a beach edition of Fitness Friday, but I can't. Yet. Give me a month or so and we'll see. 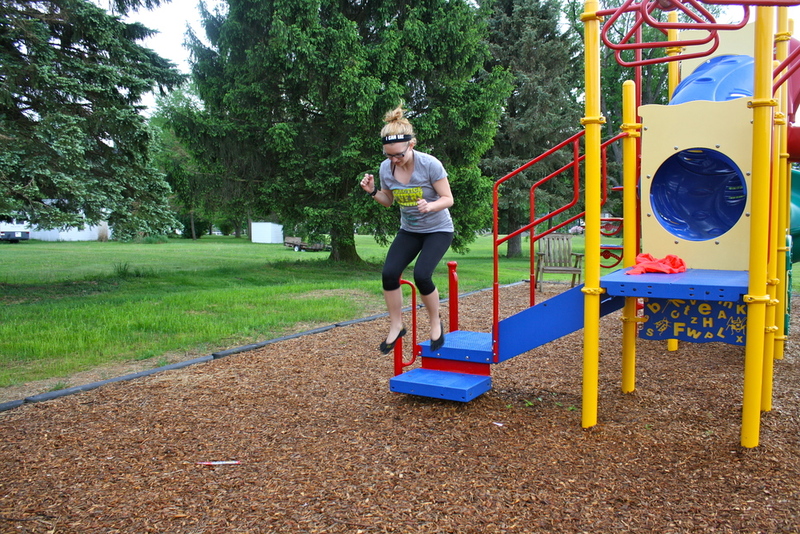 :) I figured that I'd give you the next best thing; a playground workout! So when I was thinking about what to feature for Fitness Friday, I thought that this was perfect for this week. 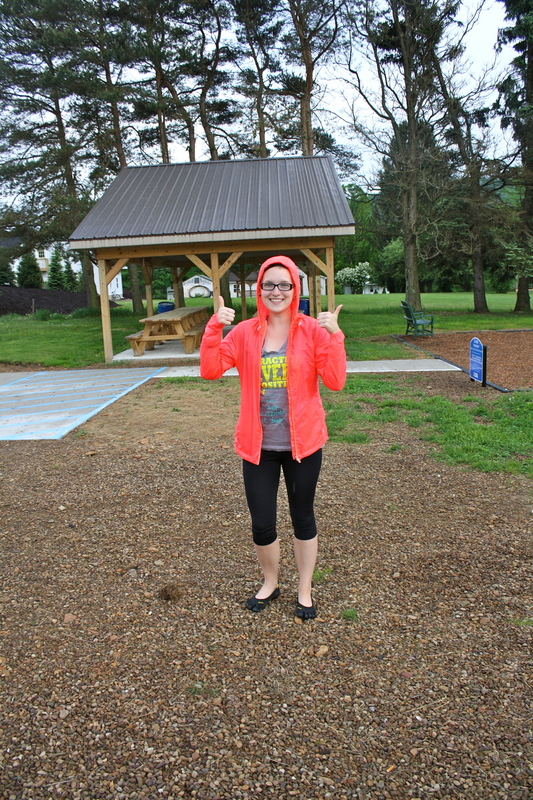 The past two days the weather hasn't been ideal for an outdoor workout, but I grabbed my sister (who wasn't very excited about the idea) and set out to show you guys this Fitness Friday: Playground edition! Last summer I got this idea from this New York Time's article about adult playgrounds. I love a good outside workout when the weather permits and I'm always looking for something new. But I know that my small town will never see an adult playground and although the playground in my town isn't very big, I work with what I have! Usually I go for a short run (about 2 miles) and stop at the playground on my way back home. This workout can vary depending on the playground in your town, but here's a few ideas to get you started! I've been working on trying to do pull ups for a long time now. My arms are definitely the weakest part of my body and I've been working on that! But if your playground has a bar like the one pictured above, get up there and try to do some pull ups! I can do 6 at the moment, like i said; work in progress! Next I do some crunches on this other bar. Are there technical names for these things? I don't know. Anyways, you could use the same bar that you use for your pull ups. I just use this one because it's easier for me to get on this one. I usually shoot for 10 of these. They're definitely harder than they look! Monkey bar time! The first few times I did this I got blisters on my hands so bad. Just a heads up! :) But after the first week or so of it, you should be good to go. I usually go across these twice. Whenever I do these the Tough Mudder comes to mind. Someday I will do it! I wish I had a few people willing to do it with me though. Any Western Pennsylvanians, Ohioans, or West Virginians interested?! Going straight from monkey moving myself across the bars to rabbit jumping all over the place. :) I usually jump up these steps and then jump down them. I try to do it about 15 times before moving on. Be careful though! There is a risk of tripping or slipping for those of us a little less coordinated than others! Repeat this workout (or one that you created on your playground) 3 to 4 more times and you'll be surprised at how sore (and fit) you can get from this! Usually I try working on various yoga poses or do a set of burpees, plank holds, squats, etc. but as I mentioned the weather before, it started to rain! After I'm done with my playground workout though, I use the short run home (about 0.25 miles) as a cool down and once I'm home I do some gentle stretching. Simple as that! You might get some stares from other adults at the playground with their children, use that as an opportunity to show them what you can do! ;) Just make sure not to knock down any little kids in the process. Use this three day weekend as a chance to get creative with your workouts. Maybe if you're camping and having a fire you can gather the wood and use the heavier pieces to squat or do overhead presses. Or if you're having a picnic at home, you can push around the picnic tables and benches to get them looking great for your party and get a little workout in at the same time. :) For me though, I think I might go into a mini hibernation this weekend. It's only 39 degrees here right now and it's supposed to be chilly all weekend! Brr. Does the colder weather stop you from getting outside for a workout or other various activities? Let me know!